Google+ Mom to 2 Posh Lil Divas: Christmas Ornament Exchange - Sign-up & Join the Fun! Christmas Ornament Exchange - Sign-up & Join the Fun! Christmas is coming & our house is buzzing with both excitement and anticipation. Last year the Lil Divas and I got crafty together and made lots of Christmas ornaments. We gifted some as presents but most of them ended up on our tree. Each year, more of these homemade ornaments make their way onto our tree, replacing store bought balls and ornaments. My dream is to someday have our tree covered in these type of ornaments. Why? These imperfect, kid made ornaments mean so much to me. They are much more priceless than those mass produced store bought ornaments. They are the ornaments that I hope to keep for many, many more years to come. They are the first presents the Lil Divas ever made for us in preschool. They hold memories of priceless moments shared creating together as a family. They hold a little piece of the Lil Divas childhood - forever captured in salt dough, pipe cleaners & beads, wooden crafts sticks or plastic balls. Unwrapping these homemade ornaments at Christmas tree decorating time, fills my heart with so much joy. Looking at the Lil Divas tiny handprints, seeing their Christmas photos through the years is one of our favorite parts of decorating the tree. The Lil Divas love seeing their old crafts and hearing the stories of how old they were when they first made them. We are all looking forward to making our yearly homemade ornaments this year and I am even more excited to be able to invite you to join in on the Christmas ornament fun this year! I'm so excited to have you all joining in. We can't wait to see what you and your kids create together! 1. Make a Christmas tree ornament, it doesn't have to be a recent one. 3. 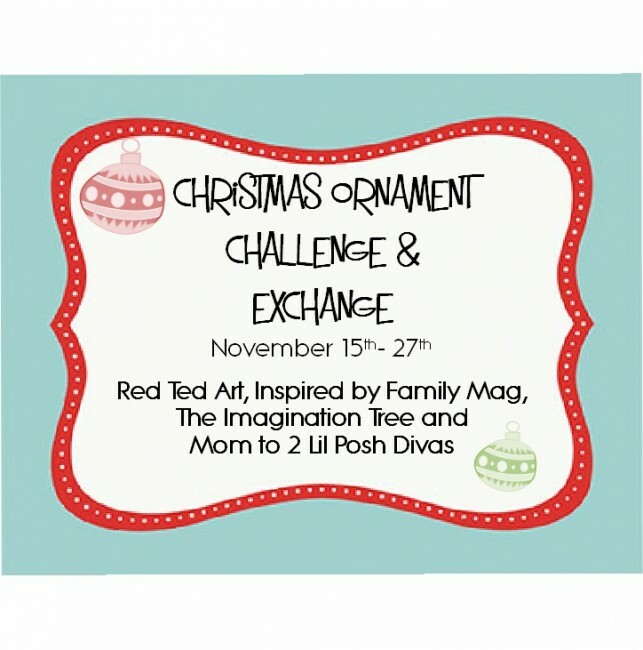 Share our Challenge on your blog and your fabulous ornament and come link it up between Nov 15th -27th. 4. If you want to be a part of the Ornament exchange PLEASE USE A LEGIT EMAIL WHERE WE CAN TOUCH BASE WITH YOU WHEN YOU LINK UP! If you don't want to be a part of the exchange DON'T leave an email when you link up. 5. On the 28th we will pair you up with another blogger who linked up their fabulous ornament. 7. Share on your blog the ornament you rec'd and the blogger who gifted it. 8. Wait expectantly by the mailbox for your christmas ornament to come in. Yay, real mail!!! Have fun crafting those Christmas ornaments! Do you have to have a blog to do this exchange? Wopuld love to koin in.